Serotonin has ended decade-long absence when the New York electro outfit makes comeback with two new releases, a various artists compilation and “Scientism EP” by Synapse, a project of label founders John Selway and Jason “BPMF” Szostek. The timing is perfect because for a while I’ve been thinking to write a piece about Serotonin’s archives, but seeing the label around is a much better way to shed light on this operation. Serotonin’s activities are rooted in earlier days, if to only look at the official website that may be optimised for Netscape and the label’s output that is strongly following (US) electro’s best traditions. In the same they are sounding fresh: The mini-compilation’s opener “Solar Sailing”, a warm and full-bodied cruiser with dubby elements, is a clear proof of Selway’s electro talent, while in “Proxy” seasoned German producer Alex Cortex brings together weighty bass and shiny synth worms. 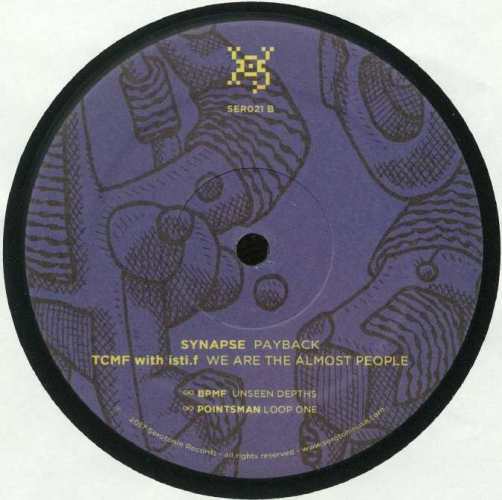 The B-side begins with interstellar explorations in Synapse’s “Payback”, the sound as crisp and clear as in Model 500’s classic releases. A new project called TCMF With Isti.F enters the stage with a bang when leaden textures and grim robo voices are testing body and mind in “We Are The Almost People”. Before all ends, locked grooves from BPMF and Pointsman serve as a nice bonus.